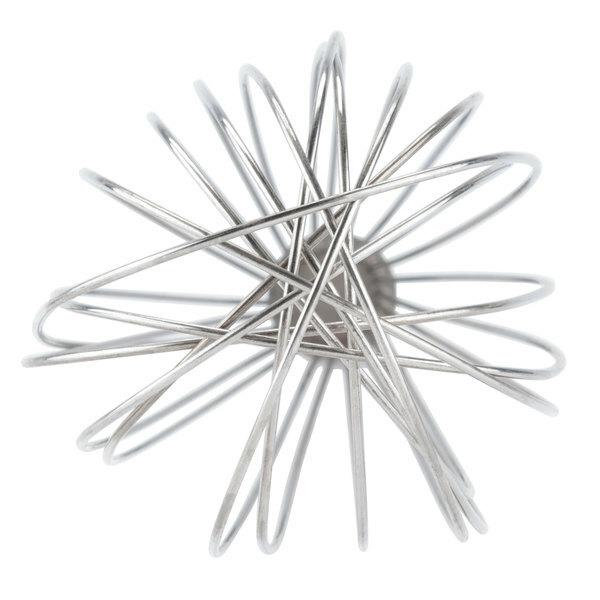 This 18" stainless steel piano whip/whisk features a lighter-gauge, stainless steel wire for whipping and aerating delicate sauces and toppings. Additionally, the moderate stature of this item allows for successful performance in a variety of bowl sizes. 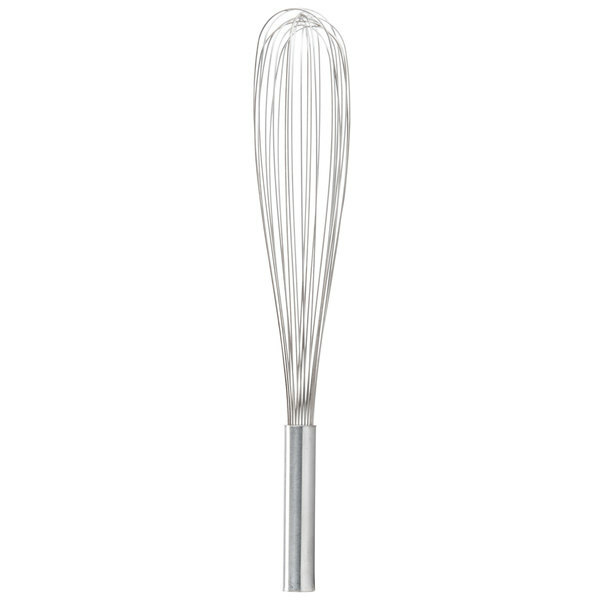 This is a very nice whisk, the handle is comfortable to hold while whisking. Very heavy duty, so it doesn't bend while whisking. It is very easy to clean, the quality is good for the price. We have multiple whisks around the kitchen here at our restaurants. We really have enjoyed these and they make making big batches a lot easier on all of us. They are really reasonable with the price too! Not quite as sturdy as Id've liked - only use for thin sauces or liquids, as any resistance will make it bend pretty badly. But good overall for those! We have had this whisk for three years now and it still looks brand new. It always gets the job done and is easy to clean. The long handle makes a easy to whisk big batches; however, very thick and huge batches make this whisk a bit flimsy. Huge batches is what I do and the whisk is still going, so it is resistant. 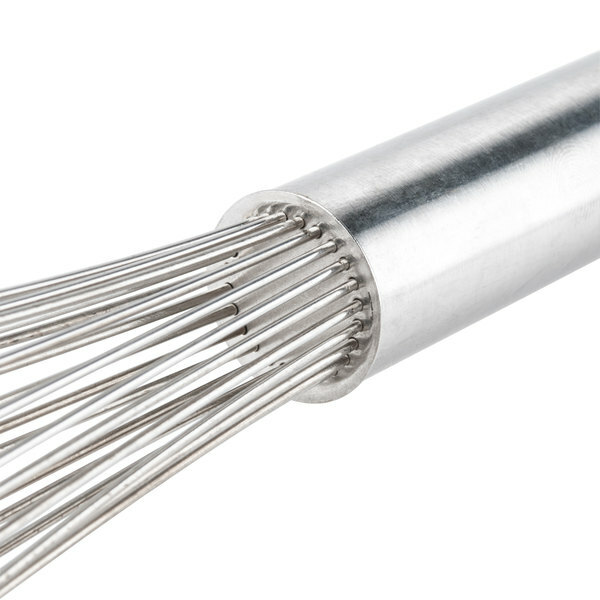 The 18" Stainless Steel Piano Whip/Whisk is an amazing whisk! We use it for our large batches of beverages at our catering events. 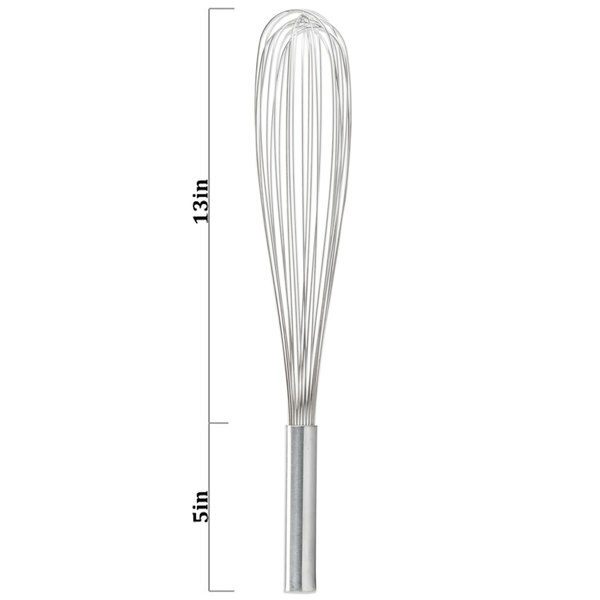 We make big matches of margaritas, tea and lemonade and use this whisk to mix and stir! Pretty good whisk - just don't use it for any tough jobs, it will get a little wonky and bent out of shape. Otherwise, whisk away!!! Used to stir tomato sauce and it seems very weak. I don't think it would hold up to anything thicker. Great whisk for emultions not for sauces. This 18" stainless steel piano whip/whisk is the most heavy-duty whisk I have ever come across. After many many uses, it holds it's shape and handles tons of mixes. The price on these whisks is amazing. They are very sturdily made, no bending of the tines while trying to whisk things. I highly recommend them. This is a great whip. Solid construction and a classy look make this whisk an absolute winner and a must have in every single kitchen setup. The handle length on this is what you’d expect, so it’s easy to manage, but the whisk length is extra-long for large batches. 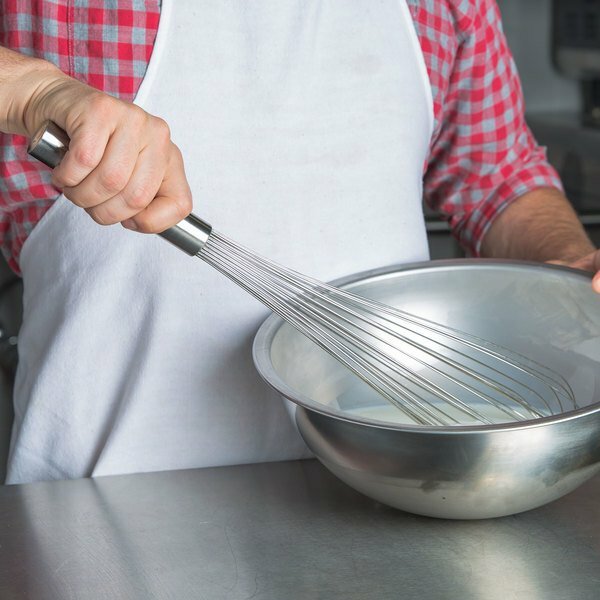 I love that I’m able to double batches with ease using a large bowl and this whisk. You don’t be disappointed in the quality and style. 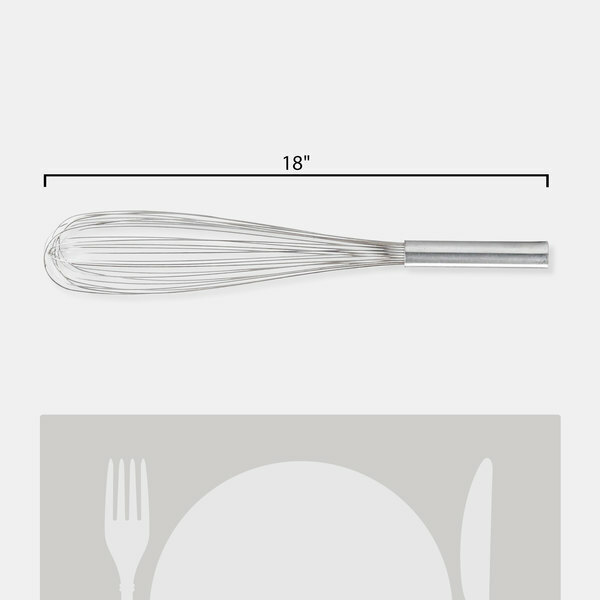 I highly recommend this 18" Stainless Steel Piano Whip/Whisk. Really good for whipping egg whites, mousses, whipping cream and custards. I will definitely purchase this whisk again. These whisks are perfect. They are durable as well. Easy to clean for a whisk as well. These have a lot of uses, but typical stuff is great. If you've got a massive mixing bowl or work primarily in a bakery setting, you need this product in your life, great length, sturdy product. This eighteen inch stainless steel whip is spectacular!! I have an extra tall stock pot and the length of this is spot on perfect!! Two thumbs up!! Very helpful for mixing up large batches of sauce. Been using these daily in my stores for months, am pleasantly surprised they have not rusted at all yet. 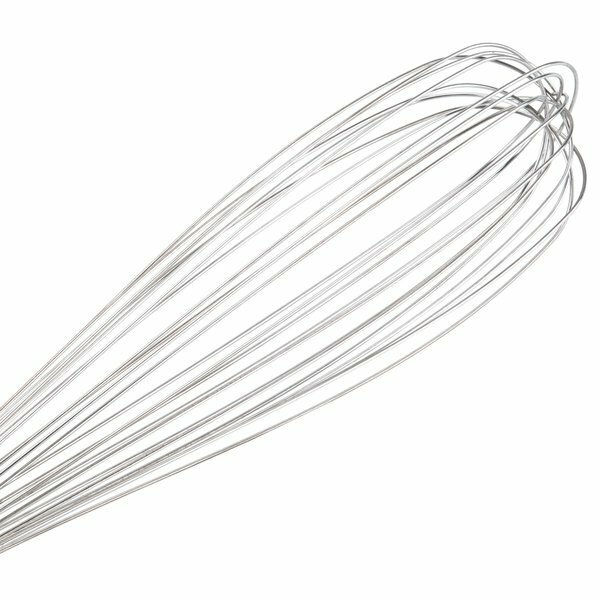 strong, sturdy and very efficient are my words to describe this whisk. they w=are made to last a lifetime and I love them. I will get extra though. These are ok for the money but they don't last much longer than 6 months so just know that going into it. This size is good for extra large bowls and mixing. The 18" Piano whip is very sturdy and so much bigger than I anticipated, but this has been a great addition to our kitchen and makes whipping pretty easy. Very thick wire whip for stiff mixing tasks. Nice long size, the build is sturdy except for the cap or the handle, which tends to be not sealed against the end. otherwise, great stuff. This is hugeee, it says 18 inch but i'm terrible at averaging sizes so I didn't expect it to be this big, however its a great quality and great value. Our kitchen wanted a good big whip for making salad dressings. This one fit the bill perfectly. The price is great. It works well and would be reordered in the future if needed. This is a very good whip. The tines are very sturdy and the handle is nice and heavy. Very pleased and will add it to my reorder list! Best piano whip whisk I've ever used. The long length keeps your hands away from heat source. Works perfectly for gravies, sauces, etc. Highly recommended. This piano whisk is huge! Great for deep bowls and pots of soup. Easy to clean. I'm able to get a good grip on it and put some power behind it when i whip cream! Best whip ever! Very well made, easy to clean (we pop it in the dishwasher), good weight and very multi-use item. A staple in our kitchen now. We really like the weight of the handle of this whisk. The whisk is great to use for whipped cream and incorporating air into icing. I love the piano style whips for whipping egg whites for meringues and souffles!! Very easy to incorporate a lot of air in little to no time!! like this whip. it works quite well and is very easy to clean and very easy to use. can whip a large quontity for sauce.